There is a hype especially about ray marching in the demoscene. This is what people call a technique that is used mostly in 4k procedural graphics and 4k intros to create 3d pictures with interesting looks. Since there used to be no comprehensive tutorial on the matter, many people initially found it confusing to understand the underlying principle, which we can see in the huge number of threads in the pouet.net BBS dealing with various aspects of ray marching. The answers more experienced coders gave were partially a bit hard to grasp, and so I guess there are still some people around who do not really feel satisfied with their understanding of ray casting, ray tracing, ray marching and the like. For these people, I've written the following article. While the first scrollers were strictly two-dimensional, 3d effects became omnipresent in demos rather soon. Already in C64 demos of the 1980s we can spot things such as rotating cubes. While first only the lines of the cubes were displayed, it did not take long until techniques to fill the sides with colours emerged: flat shading, gouraud shading, phong shading - you name them. Cubes were followed by more complex objects such as dodecahedra. To display spheres, a technique known as tessellation was used: the round surface was subdivided into a lot of small polygons; thus the shape of the sphere was approximated. Ray casting, ray tracing, ray marching - are they different things, or are they just different names for the same thing or similar things? The latter possibility applies. As a matter of fact the original method is ray casting, and the other two are just variants of it. Ray tracing is a more sophisticated algorithm involving diffraction and reflection, thus generating images looking even more realistic; alas, it is computationally more expensive, of course. 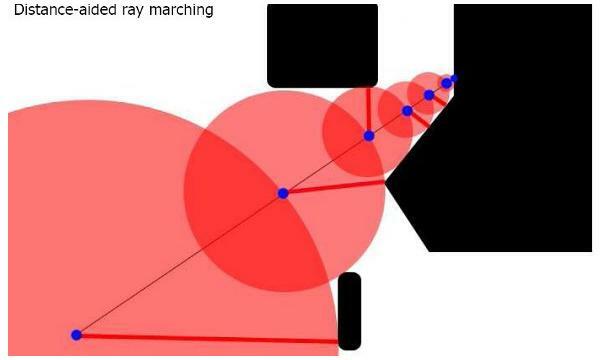 Ray marching, which is the thing that is so popular in the demoscene at the moment, is a variant of ray casting that permits the use of objects for which there is no analytic formula so that the intersection with the ray cannot be simply computed by solving an algebraic equation. Ray marching is also called sphere tracing, for a reason I will explain later on. Actually what's most widely used in the demoscene is not the general ray marching algorithm, but a variant of it involving a distance field - I'll show you what this is all about. Of course ray marching and ray tracing techniques can be combined (and that's just what's done in the demoscene), the two terms are not mutually exclusive. That means: Any point P is the sum of the coordinates of a point A plus the product of a vector AB and a scalar t.
Here C is the center point. By inserting the coordinates of A, B and C and solving for t (quadratic equation, solvable using the standard formula for quadratic equations) we can compute the coordinates of P.
So that's how traditional ray casting works. How about ray marching? The ray marching algorithm has the advantage over traditional ray casting that you need not compute intersection points analytically. Instead, you walk along the ray and simply check after each step whether you've hit an object. What is especially popular in the demoscene at the moment is distance-aided ray marching. The basic idea is that the distance per step is not constant, but variable. It depends on the distance of the current point to the object that is closest to it. If you know that distance, it is safe to walk exactly that distance on the ray, as chances are zero that you will hit an object if you walk less than that. 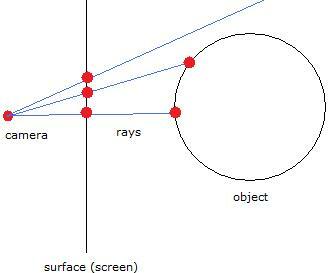 The distance to an object can be computed far more easily than the distance between a point and the intersection of a ray starting at that point with an object. For example, if the object is a sphere you only have to compute the length of the vector from the point to the center, and subtract the radius from it. The reason why ray marching is sometimes also called sphere tracing: You can picture the distance between two steps as the radius of a sphere. Each of these spheres touches at least one object. So you virtually follow the intersection points of these spheres with the ray.